While night sweats can be uncomfortable and disruptive, they don't usually signal a more serious underlying condition. In fact, night sweats are one of the most common menopause symptoms, with up to 75% of women experiencing them at some point during menopause. When a woman approaches menopause, she may have many questions about the potential symptoms, including night sweats. Understanding what to expect, why these symptoms occur, and how to manage them can help a woman better prepare for this transitional period. Keep reading to learn more about night sweats. Night sweats, medically termed "sleep hyperhidrosis," are episodes of nighttime sweating, ranging from mild to profuse perspiration. Night sweats are similar to the hot flashes that can affect menopausal women during the waking hours. Oftentimes, night sweats can be so intense that they interrupt a woman's sleep, which can affect many aspects of her daily life. Common symptoms of night sweats include sudden and intense heat, irregular heartbeat, nausea, flushing, chills, and headaches. Women with menopause-related night sweats may experience anywhere from mild to severe symptoms, varying in duration, during their usual sleeping hours. Many women in their 40s and 50s develop night sweats, often beginning before the cessation of the menstrual cycle. One study found that approximately 19% of women aged 40 - 55 who still had regular periods experienced night sweats. Most women begin to develop symptoms two to ten years before menopause occurs, during the span of time called perimenopause. Many different factors contribute to how women experience menopause symptoms. Age, race, and other factors can influence how likely a woman is to develop night sweats during menopause. Age can affect a woman's experience of night sweats. One large study found that younger women are far more likely to experience night sweats. Another found that only 10% of patients older than 64 experienced night sweats. Studies have found that the prevalence of night sweats varies by race. One study found that three in four Caucasian women experience night sweats. Another found that African-American women were more likely to have night sweats than Caucasian or Hispanic women. Asian women were the least likely to report night sweats. Click here to learn more about night sweats, or continue reading below to learn what causes night sweats. Are Hot Flashes at Night Considered Night Sweats? While a significant proportion of women experience hot flashes during the menopause, night sweats are less common. Both can be upsetting and difficult to manage, often causing irritation or embarrassment. Being somewhat prepared for these bouts of heat can be helpful when going through this stage of life. If you find you are not able to rid yourself of this symptom, there are several coping methods that might make it easier to live with. These include avoiding alcohol and spicy foods, and ensuring that your bedroom is kept cool with open windows and the use of a thin blanket instead of thick bedding. Many women who experience night sweats want to know the reason behind their symptoms. While the exact cause of night sweats is unknown, hormonal fluctuations are one of the primary factors in most menopause symptoms. During menopause, estrogen production levels drastically decrease. This change affects the hypothalamus, the part of the brain responsible for the regulating body temperature. As a result, the hypothalamus often prompts a series of physiological reactions resulting in hot flashes or night sweats. While hormonal imbalance is the most common cause of menopausal night sweats, there are also rare medical causes, such as diabetes, anxiety, neurological conditions, sleep apnea, cancer, and thyroid disorder. Certain factors can increase the duration and severity of night sweats. Avoiding these triggers can help to alleviate both hot flashes and night sweats. Click here to find out more about the causes of night sweats, or continue reading below to learn more about treatments. If your hot night sweats are a result of an emotional problem such as stress and anxiety, while it might be possible to administer coping methods it, will be necessary to address the root of the psychological problem in order to cure the condition altogether. Can Diabetes Trigger Night Sweat Episodes? Diabetes is a lifelong condition defined by abnormally high blood sugar levels. It is manageable with insulin and a healthy diet, but it's vital for a diabetic to be aware of symptoms of blood sugar abnormalities. Night sweating episodes can indicate low blood sugar. Read on to learn more about diabetes and what sweats could symptomize. Treating of night sweats often begins with lifestyle changes. This approach typically involves avoiding night sweats triggers and taking steps to relieve stress and improve diet and exercise. Tryptophan, for example, is an amino acid that helps aid in sleep and can be found in dairy products, nuts, and eggs. By incorporating more tryptophan in your diet, you can improve your overall quality of sleep. While these lifestyle changes can help to relieve night sweats and improve sleep patterns, they do not treat the root cause of night sweats, which is hormonal imbalance. Fortunately, alternative medicine treatments can safely and effectively correct hormonal imbalances with little or no risk. In fact, many experts recommend combining lifestyle changes and alternative medicine for symptom management. For some women, however, these changes are not enough to alleviate their symptoms. In such cases, they may want to consider prescription drugs or other clinical methods. Before beginning these treatments, however, it is recommended that women consult a trusted medical professional to better understand the potential benefits and risks of these prescription medications. Most experts recommend that women begin with lifestyle changes and alternative medicines before trying prescription medications in order to alleviate their night sweats. The best treatment options, however, vary from woman to woman. Click on the following link to learn specific treatments for night sweats during menopause in these three categories. It is widely acknowledged that the side effects and cautions attributed to prescribed drugs are usually more severe than those that are associated with alternative medication. Having said this, it is important to remember that herbal supplements can also have dangerous interactions, and so you should always adhere to the recommended dosage. In general, herbal supplements are considered to be safer - as well as cheaper - than prescribed medication for general consumption. Having said this, it is important to read and adhere to the supplied directions, exceeding the recommended dosage of natural medication can have dangerous side effects too. Boston Women's Health Collective. (2006). Hot Flashes, Night Sweats and Sleep Disturbances. Our Bodies, Ourselves. 09/10/2018 Bed sheets come in all shapes, sizes, and colors, but not all are created equal. It's no doubt that night sweats can leave a woman damp and in a bad mood the following day from disrupted sleep. Learn more about some of the best bed sheets for night sweats to finally get decent rest. 03/17/2017 Night sweating during menopause is not just due to hormones. Much of the time, environmental, dietary, and other lifestyle factors trigger this unpleasant symptom. It's important to scrutinize and adjust your lifestyle if night sweating episodes are affecting your ability to sleep peacefully and causing tiredness during the day. I'm in My Thirties: Are Night Sweats Normal? 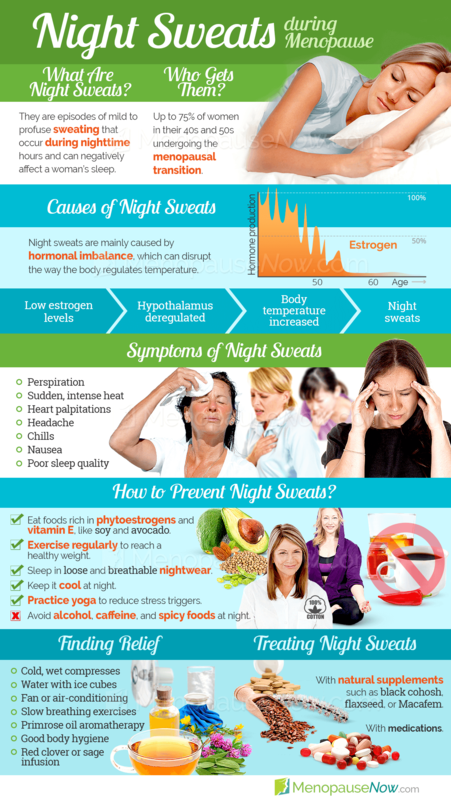 10/22/2015 Night sweats are commonly associated with menopause, but they can afflict people of any age. Triggered by environmental, dietary, and medical causes, sweating episodes often interrupt sleep, and may ultimately result in fatigue, which makes it all the more important to understand what's causing them and how this can be.